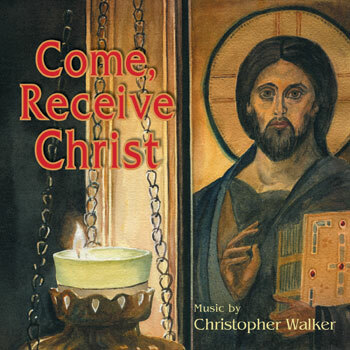 Enjoy an eclectic variety of styles in this collection of liturgical music from the renowned Christopher Walker. Christopher Walker, one of OCP's best-known composers and the 2005 Unity Award Winner, is internationally active as a clinician, conductor and performer. This collection of all-new liturgical music, his first since "In Faith, In Hope," represents an eclectic variety of styles, and includes the hugely popular title song, "Come, Receive Christ." From anthems to assembly music, from the rich harmonies of the "Blessing of a Sacred Object" to the energetic "Hosannah to the Son of David," the pieces on this album will draw congregations closer together and closer to God. This recording and packet of 12 octavos includes nine titles which can be used in the worship program, along with several unison pieces reminiscent of Byzantine chant, simple versed plainchants for Mass (gathering, communion and sending forth) and a wide array of ritual music. With settings of beautiful texts by Sister Paule Freeberg, DC, Joseph Reuter, and distinguished poet Sister Genevieve Glen, OSB, these songs will endure to serve worshipers and liturgists for generations to come. Christopher Walker, one of OCP's best-known composers and the 2005 Unity Award Winner, is internationally active as a clinician, conductor and performer. This collection of liturgical music, his first since "In Faith, In Hope," represents an eclectic variety of styles and includes the hugely popular title song, "Come, Receive Christ." From anthems to assembly music, from the rich harmonies of the "Blessing of a Sacred Object" to the energetic "Hosanna to the Son of David," the pieces on this album will draw congregations closer together and closer to God. This recording and packet of 12 octavos includes 9 titles which can be used in the worship program, along with several unison pieces reminiscent of Byzantine chant, simple versed plainchants for Mass (gathering, Communion and sending forth) and a wide array of ritual music. With settings of beautiful texts by Sister of Charity Paule Freeburg, Joseph Reuter and distinguished poet Benedictine Sister Genevieve Glen, these songs will endure to serve worshipers and liturgists for generations to come.